Would you like a few egg decorating ideas? Perhaps the most popular tradition for spring and the Easter season is decorating eggs. But, who wants to make the same old dyed eggs with the vinegar and powdered dye that comes in those little boxes from the grocery store? Why not jazz up your eggs this year? It doesn't take a lot of creativity to come up with all sorts of cool ways to make egg decorating more fun. Here are just a few ideas, and some of them even use that sad egg dye. The two most common ways to preparing eggs for decorating are hard boiling and "blowing out" the egg while still raw. Traditionalists will use raw egg shells with the eggy matter still inside. Once the shell and egg dry out, the egg is fine to save and use for many years. Of course, raw eggs are fragile, and if the egg should happen to break before the drying is done, it won't smell very nice. The easiest method for making boiled eggs is to put your eggs in a pan with a lid and cover the eggs with cool water. Allow the water to come up to a boil, turn the heat off, put the lid on the pan and leave the pan on the hot burner. Let the eggs steep for 13 to 15 minutes and then drain the water off. 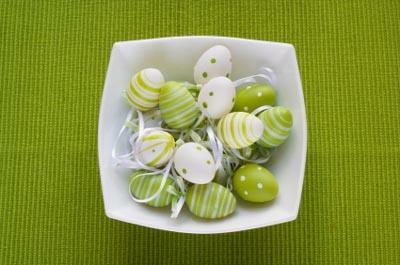 Leave the shells on for decorating, but remember to only use food-safe dyes if you want to eat the eggs later. To blow out an egg, pierce the top and the bottom of the egg with a needle or pin, making sure you pierce the yolk. Blow through one of the holes until all the egg stuff has come out. Because this puts you into contact with raw eggs, make sure you wash the eggs in warm water (gently!) first, and use eggs that are fresh, have been refrigerated and aren't cracked. Don't let the kids, the grandparents, or anyone with a compromised immune system do this. There's really no end to the variations you can come up with when thinking about decorating eggs. You can decorate them with paint pens, glitter pens, stickers and stencils, wrap them in paper, glue on beads and sequins, make tiny clothes out of paper or fabric and draw on faces, paint them with paintbrushes or whatever else you want. Here are some more ideas to try for eggs you don't plan to eat. Just like you can decoupage boxes, picture frames, mugs and many other objects, you can decoupage your eggs. A great way to do this is to tear up pieces of colored tissue paper and randomly (or in a pattern) glue pieces to the egg. Cover with decoupage medium or diluted white glue and allow to dry. If you have a modern home but still want to be able to display Easter eggs, why not decorate with spray paint? Spray paint comes in so many different colors and textures these days that you can make an egg look like just about anything you want. Consider some of the many options: gold leaf, silver leaf, chrome, frosted, iridescent, textured, stained glass effect, even chalkboard paint. You could paint on stripes, use solid colors or play with different textures in the same color family for a very interesting Easter basket. Or course you can still use the traditional dye to make your eggs, but why not make it a little more interesting? One quick way to make more dynamic eggs is to wrap the egg with a few rubber bands. Don't cover the whole egg, but make sure you have a few places covered up. Dip the egg in the dye, then remove the rubber bands. Your egg will have random white stripes where the rubber bands were. Another great idea is to use a simple sticker (such as an initial letter, a star, a flower, or something else basic) as a resist. Place the sticker on your egg and dye as you normally would. When the egg is dry, peel off the sticker and you will have a white spot in the shape of the sticker. You could do this with gold stars and blue dye and make a starry night egg. Acrylic paint is another interesting choice for decorating Easter eggs. Of course you could use paints with brushes and apply stencils or just paint free hand, but you can also use paint to play with texture on your eggs. Just about anything in the house with an interesting texture could be used to decorate Easter eggs, including sponges, crumpled newspaper or plastic wrap, the inside of a corrugated cardboard box and bubble wrap. If you have texture plates in your scrapbooking or card making supplies, they might also be useful, but be very carefull not to apply too much pressure if you are using blown or raw eggs. You won't really be able to reproduce a Faberge egg in your kitchen, but you can have fun trying with a few simple things you already have around the house. Glitter glue can help you draw fancy lines on your egg after you have died or painted it. Where the lines intersect, glue on sparkly beads, rhinestones or sequins. Add whatever other decorations you want to make your eggs stand out from the crowd.